Being a native from Buffalo (and not NYC), it’s fun to be a tourist every so often in my adopted city. When my family or friends come to visit from out of town, I really enjoy taking a walking tour of a new neighborhood or area that I’ve never been. Not only does it provide a really great tour of NYC by an expert — I’m learning something as well. But by far the favorite tours we’ve taken, ones that involve food are at the top of the list. There are a number of food tours provided by Free Tours By Foot and the ones at the top of our list involve food — duh. Here are a few of our favorite places from the afternoon. 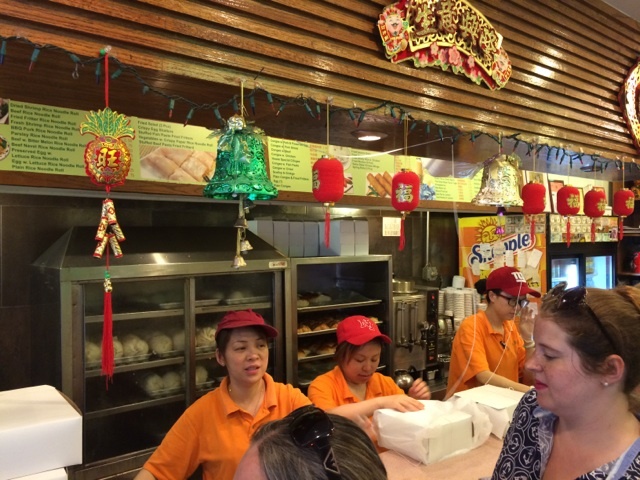 Cash only, quick and delicious — this place was a slightly nicer version of the “Soup Nazi.” Tell them which dumplings you want (fried or steamed) and then toss over your $1 — yes, one dollar bill — for 5 perfect dumplings. Highly recommended dive spot to get something delicious and continue your day through Chinatown. The specialty at this spot was the spicy cumin lamb burger, with diced lamb sautéed with jalapeños, red onions, and scallions, stuffed into a crispy flatbread-like bun. Additionally, Xi’an also offers an impressive noodle menu at their many NYC-based locations. 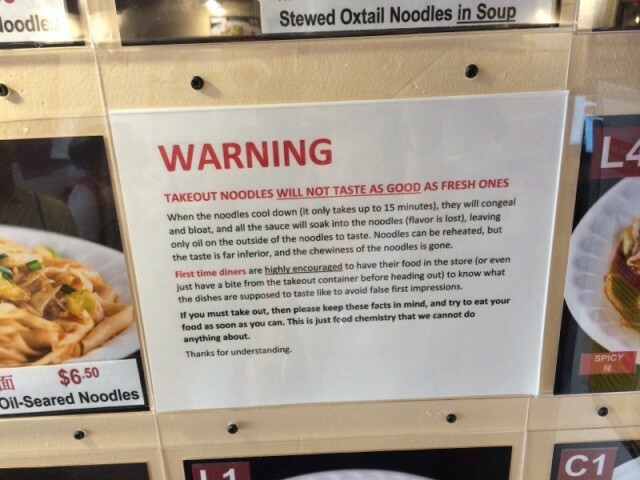 They also offer this warning, don’t take out the noodles — eat them fresh! 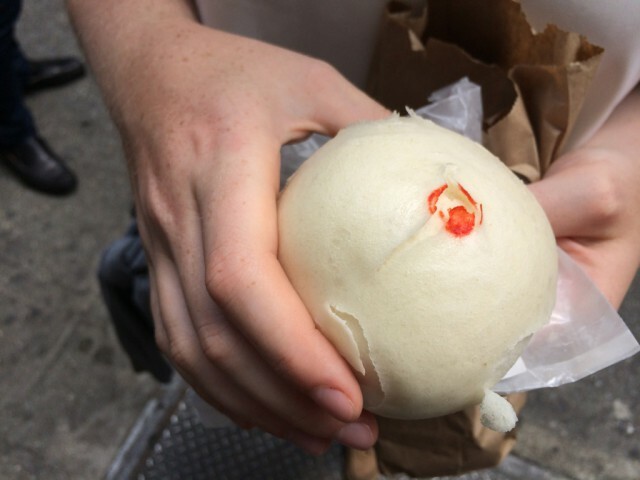 Famous for their pork buns, and all other kinds of buns, we couldn’t wait to give it a try. We went traditional instead of steamed and they were really good — but filling. 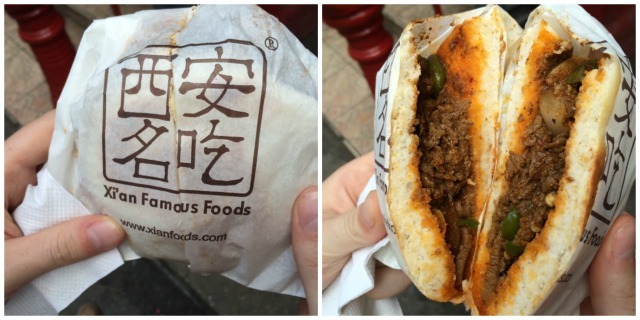 The bun part (aside from the inside filling) was a lot to eat, especially at the end of our food adventure. Trying the steamed pork bun and steamed lotus paste bun (which was very sweet and reminded us of a breakfast pastry) were solid choices. And also, $1 a piece. 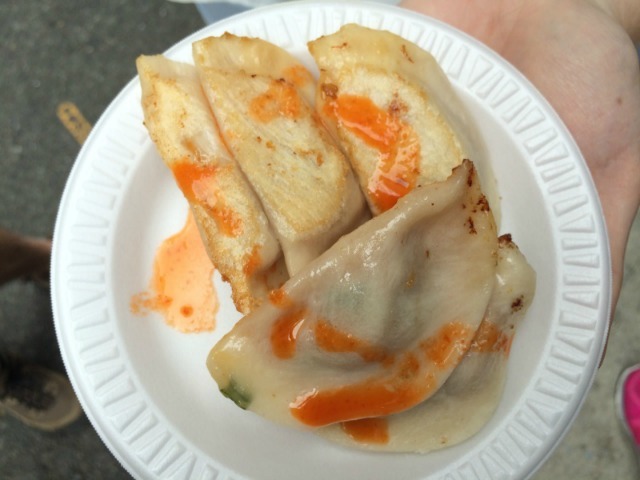 These were just three of the many stops we made on the food tour throughout Chinatown one afternoon. Some places we grabbed a snack, some we were too full to indulge. But one this is for sure that Chinatown has an incredible restaurant and shop variety that could be the most affordable in the entire city. If you’re up for something new and different or love Chinese food already, just start walking through the neighborhood — you’ll have so many good options, you’ll have to come back for more. Tags: chinatown, chinese, Cumin, dumplings, food tour, Fried Dumpling, Lamb, Mei Li Wah Bakery, Pork Buns, Xi'an Famous Foods. Bookmark the permalink.